Additional Info: Many new additional items to lounge and kitchen areas, includes new table chairs, grey console table, grey nest of tables new dark grey sofa with chaise to end of sofa sprung mattress and additional bed sofa with sprung mattress 46” TV with stero sound . This Lodge has been vastly updated this season 46" TV console games stero unit dvd and new soft furnishings and blinds throughout lounge area to improve the light and new New vinyl flooring throughout lounge area, kitchen and hallway. Master bedroom new bed, also has additional small tv, new white dressing table and side tables large spacious wardrobe with mirrors Many additional items in storage cupboard including ironing board and cleaning equipment. Many additional items in kitchen area includes dishwasher, large gas range and American fridge/freezer and microwave. £100 deposit to secure booking non refundable for 7 nights on cancellation of booking. £75 deposit non refundable for 3/4 nights non refundable on cancellation of booking. £100 Care and Respect Bond payable with final payment 6 weeks before arrival of holiday. Refundable Within 3/4 days after inspection for any damage, losses or breakages Booking in from 14.00 booking out before 11am key details will be informed upon final payment, ensure When booking please give address details and banking details upon departure so that your Bond money can be transferred back within a few days after our inspection of the lodge that it has been left how you found it. Situated in a quite friendly location 5 minutes from complex . Gas central heated double glazed. Large spacious lodge kept in a very clean comfortable immaculate condition home from home.Outside lighting. 2 large sofa beds both with sprung mattress new soft furnishings to lounge area gas central heating 46”Flat screen TV/DVD and free-view and stero equipment .games console.Electric fire. New large rug to lounge. Opening out with patio doors to decking lounge and patio areas with lounge and patio furniture to both areas including plants and solar flame lights. New curtains and blinds to lounge area and kitchen. Fully equipped modern kitchen including American fridge freezer,double gas oven, hob grill and hob with hood dishwasher, microwave, toaster, kettle, crockery, glasses, cutlery and many more additional items. Storage cupboard to hallway housing gas boiler, ironing board and cleaning equipment. Ensuite Shower, WC newly updated vanity unit New cabinet above to house yr toiletries large modern double shower, heated towel rail. Bedroom 2 Double new comfortable sprung mattresses full sized twin beds with storage shelves above beds and side cabinet with lamp. Leading into walk-in double wardrobe to left hand side and display cabinet with shelving to right hand side leading into bathroom. This Lodge has been recently updated with all new furniture to lounge kitchen bathroom and bedroom areas. Pls note we accept dogs but they must be kept on leads and must be clean and free from any infestation and are only allowed in the Cedars Lawn area and outside of complex this is Havens rules there is an additional charge of £15.00 for each dog maximum of 2 small or 1 medium dog ONLY. PLS NOTE: photos will be avail after March when Haven opens for the season photos of decking ONLY pls see 5814, if any concerns. 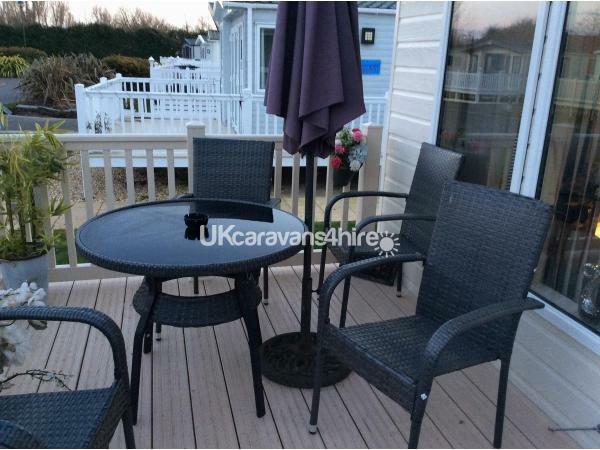 Lovely caravan in a good location with easy access to restaurant,swimming pool and entertainment complex.Good external seating on surrounding verandas and in grassed area,Easy parking in designated area.Owners great to deal with! !See you next year!!!!! Myself and my husband and two girls had a wonderful stay. 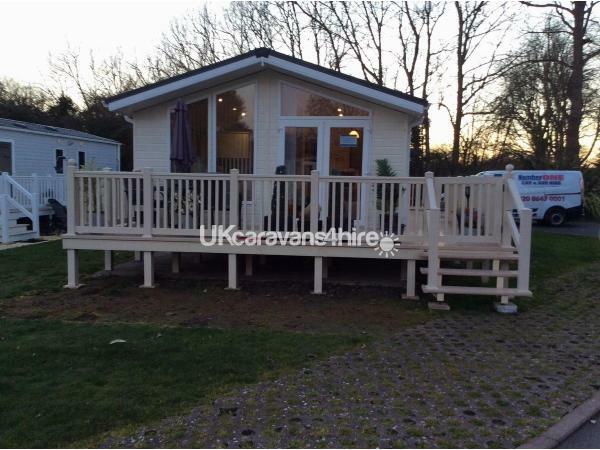 This caravan is lovely and has everything you need and more. Wendy was very helpful and accommodating and could not do more to assist you enabling you to have a very successful family break away. Would stay again in this accommodation . We had a great week at this caravan. We are a family of 5 and our Cockapoo. This was are dogs first holiday and the caravan decking was excellent for him to have a stretch and play a little ball. The beds in the caravan are super comfy better than many other caravans we have stayed in. The shower was very powerful and gave plenty of hot water. There are plenty of things to do in the area. Our favourite was Brean Down. We also traveled to Cheddar which was lovely. I would recommend this caravan to anyone looking for a holiday in Burnham.